The Juneau Police Department is reaching out to the community for information on still missing hiker Sharon Buis. Detective Nick Garza is with the criminal investigations unit. He’s been working on the missing persons case since Alaska State Troopers exhausted the initial search May 29th. Garza says there have been no developments or leads. 48-year-old Buis was last seen May 23 at Alaska Marine Lines. “If anyone in the general public recollects seeing Sharon anytime on Friday the 23rd, or ran into her on the trail, has come across any camping equipment or anything on the mountain, or hiking equipment that seems to be abandoned or laying around, give us a call. We need those leads. We’re still searching. Anything as minute as someone may feel it is could help lead us to find Sharon or what happened to her,” Garza says. There were no definitive sightings of Buis on May 23, Garza says, other than by staff at Alaska Marine Line. He says Buis ran a personal business, in addition to her job as a physical therapist, and was shipping two orthopedic office chairs to customers that day. Garza says he has searched Buis’s home several times and has found nothing of note. He says Juneau Police Department still has no reason to suspect foul play, but isn’t closing the door on any possibility. “These cases remain open for investigation until we can locate the person. This case is not going to be closed, is not going to go away until we can find out what happened to Sharon,” Garza says. Garza is in regular contact with those leading the ongoing volunteer search effort, like Luke Holton and Chelsea Karthauser. 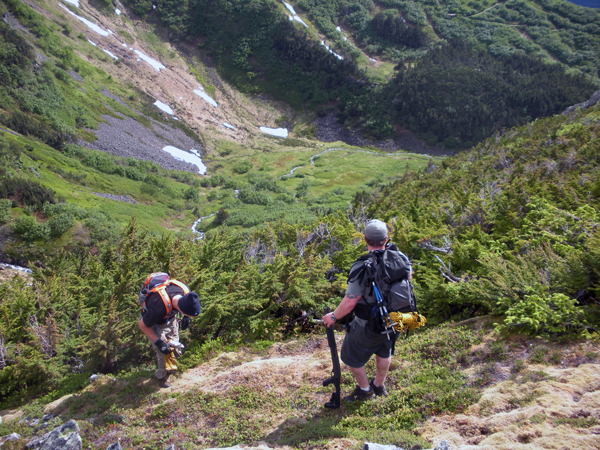 Karthauser says volunteers on Sunday scoured the ridge above Last Chance Basin, also known as Bear Ridge, and found a few items – a cup, a yellow tent bag and a tent stake. Karthauser says two of Buis’s friends don’t recognize the items, but she still plans on submitting them to Juneau Police. No organized searches are scheduled yet this week due to weather. Karthauser and Holton are temporarily leaving Juneau soon and hope others will take the lead in organizing the volunteer search effort. “We just want an organized effort to promote safety because it’s just not safe to go out there without any kind of precautions. It’s really necessary. I think that’s a lesson everybody has learned from this,” Karthauser says. Anyone with any information on Buis should contact Juneau Police at 586-0600.